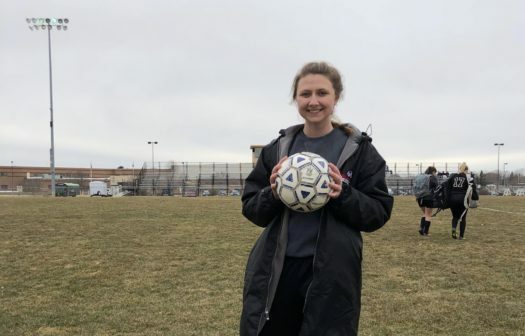 The Shawano High School girls soccer team was off to a good start with a win against Waupaca. They are progressing with the leadership of many, especially senior Makayla Stoddart. “I believe I was chosen as a captain because I have a greater understanding of how the game works due to the time and experience I have gained the past few years. I am able to use my understanding to guide other players during a game and practice. Being chosen as a captain this year is a great honor,” described Stoddart. The season started earlier than normal, and it is taking time for the team to adjust and strategize. With games practically every other day and spaghetti dinners in-between the schedules are very hard for the student-athletes. The team spends a lot of time watching film and examining what needs to be fixed. They also set personal and team goals that can be measured and achieved. Like many, Stoddart has experienced setbacks with injury and strived to get better to support her team. Coming to terms with her injuries and what she could do about them is what made her resilient. “Last year I was benched for the majority of the season due to some recurring injuries. I worked hard over the preseason to strengthen my weaknesses to prevent the same injuries. I had a few setbacks as I worked because recovery was taking more time than I had anticipated. Once I realized that my recovery wasn’t going to happen overnight I became mentally stronger, and that really helped the process,” stated Stoddart. Many athletes have someone to look up to in a sport they are passionate about, whether it be a player on the team, a graduated team member, a coach, or a family member that has guided them in their passion and will continue to. “My biggest motivator is definitely my Dad. He taught me everything that I know about soccer and continues to teach me now. I love this sport with all my heart, and without him, I would have never started playing. I am so thankful for his continued support in my last high school season,” said Stoddart. Sports are meant to teach life lessons and responsibility to those involved. Adding pressure to students’ lives is what will make them stronger in the end.